*Note: VDS opens 1 hour prior to Raptor departures. So for 8 AM scheduled departures, the store is open at 7 AM. 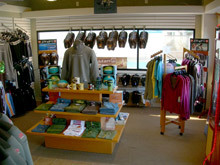 Ventura Dive & Sport is the only dive center in the state of California that is totally self-sufficient in terms of offering all levels of diver-training (from beginner to instructor), an on-site heated pool and the added bonus of a state-of-the-art dive boat docked within a stone's throw! Why go anywhere else? Dive the newest dive boat in Ventura!. Offering: 2 and 3 tank dives to Anacapa and Santa Cruz Islands, in the beautiful Channel Islands of Southern California. 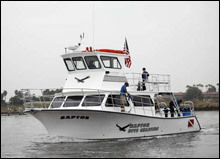 The Raptor is a custom-designed 46’ dive boat. With a 20-Knot cruising speed Anacapa is only 40 minutes away. For information on Private Charters, Click Here. surrounding the taking of lobsters.